We don’t do lunch. Well, not proper lunches. Not Prawn cocktail, great slabs of roast beef and Black Forest gateau. (Why ever not, you cheapskates?…Ed). Usually it’s maybe a simple two courses and a glass of something cold and white, and some water. Probably the Drum and Monkey if we’re lucky. And indeed for us also. The home base at Oldstead started out quite informal – but great – and morphed into the temple to Yorkshire provenance that it is today. Familiar to us since it opened, it might not be “the best restaurant in the world” (according to s…advisor – “really? said Jay Rayner) but it’s well up there and, being in Yorkshire, has a strong head start. 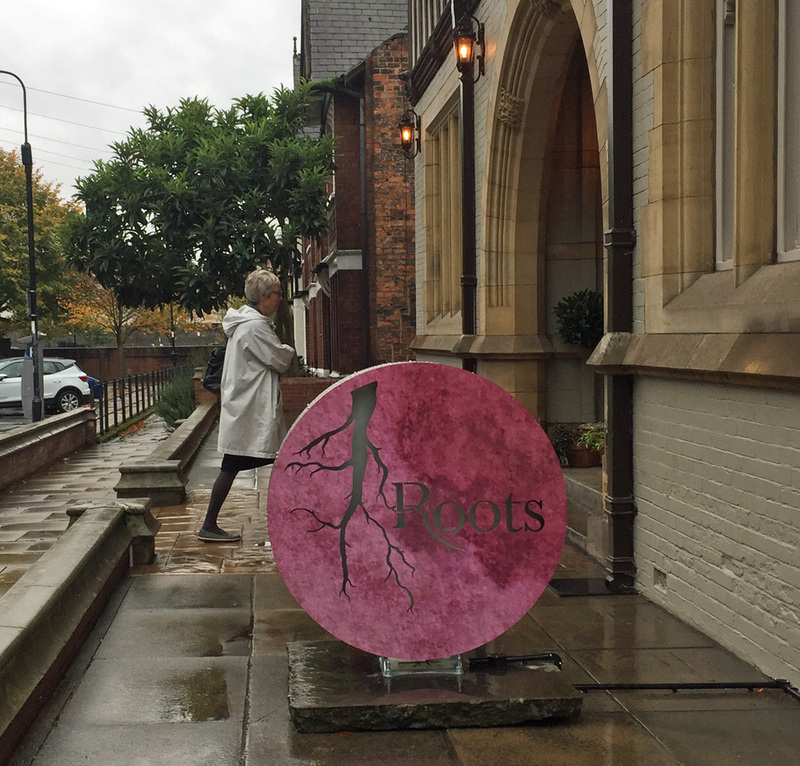 So, to Roots – the second venture and a city location. 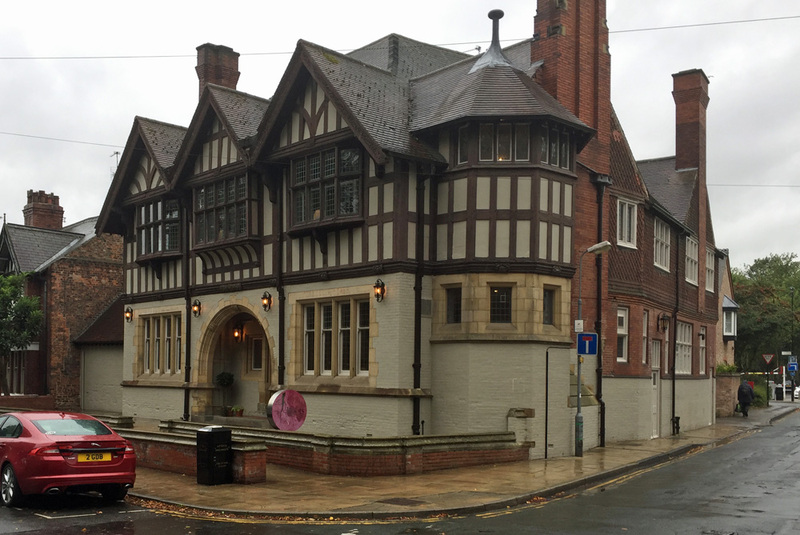 It’s outside the city walls but must feel confident enough in itself to survive – mind you there are already millions of places to eat inside the walls, and the latest national newcomer (the Ivy) is nestled up right next to Bettys in St Helen’s Square. A bit like The Ivy, Roots has someone in the lobby ready to receive guests – a bit of a lonely job – and then usher them to the restaurant. James Banks was front of house when Grace visited but today, in pursuit of ensuring the Bank’s ethos travels across both sites, Tommy is cooking and visible on the pass. The interior is a similar Scandi-meets-Cranks theme to Oldstead, with a couple of carpets to soften the reverberations and the over abundance of oil panelling and flooring. Has that ‘designed by an architect’ look. Nothing unnecessary. The cooking is driven by local home produce and local suppliers – the Yorke Arms has a small scale garden, and Le Manoir quite a big one – crucial to delivering flavour with no food miles – so they’re in good company [the other two best restaurants in the world]. For newbies like us the menu is a little confusing. We were recommended to order 7 or 8 dishes to share, or take the £50/head “pot luck”. We order 5 and it’s plenty, as we’re going to have 2 puds. We make sure we include the beetroot. The couple at the next table had at least two of those. We washed it all down with 375ml of Pinot Noir served in a very elegant decanter. 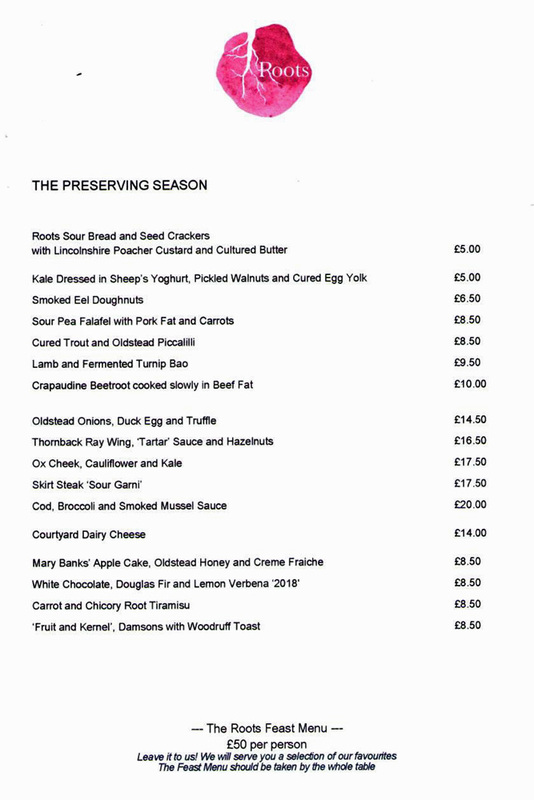 Nearly everything on the menu derives from the Oldstead garden, or local suppliers, and really celebrates local home grown produce transformed into works of culinary art. Next time it’s the full 50 quid job – it’s that good. Great. Stunning. Or as we say in Yorkshire, not bad. Restaurant Roots. Right next to St Mary’s car park (allow a tenner) and an easy stroll along the river into the centre. 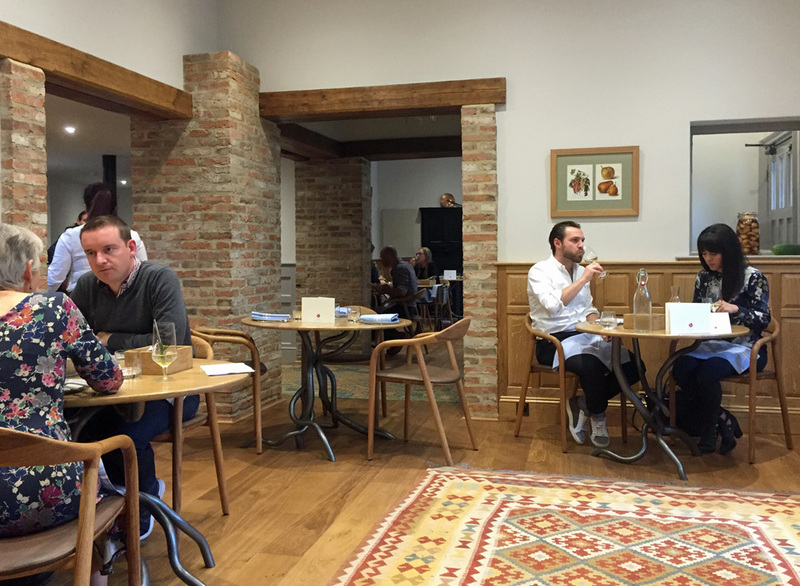 And prepare for the £25/head deposit when you book…it could catch on, this lunch thing. …it looks better when it’s not raining. Car park to the right.